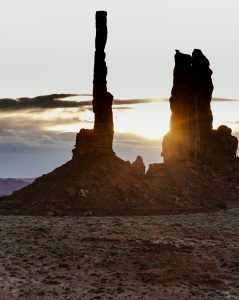 Tse Bii’ Ndzisgaii or “Valley of the Rocks” is the Navajo name for Monument Valley. It is predawn and I am here on a photo mission. 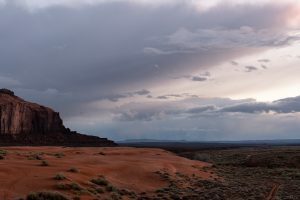 I have hired a Navajo Guide to take me off piste, away from the familiar 17 mile loop drive, and into the desert for in search of a different perspective of this well traveled valley. At O-Dark-O’Clock we start our foray into the night. The large SUV swaggers on its frame as it descends down the hill road. Water from the recent rains pool in the rutted dirt. If it were light, I would see that the tops of the eastern buttes are touched with snow. But that perception eludes me before dawn, when all is dark. It is the darkness of nowhere, and it is everywhere. The headlights shine their narrow beam across the red orange sandstone soil and the scrub brush. The landscape jumps to life in vivid color then recedes back into darkness as we pass. We are a tiny ray of light in a sea of endless night. Our vision is limited to what lies immediately before us. Yet there is power in the dark. Here in the predawn hours, one’s senses are heightened. It’s a primal awareness where one feels the presence of the earth and the smallness of man. It’s a primordial power of the ages, that speaks to one’s soul a hundred years past and a hundred years hence. There is power in the earth. It is too dark to distinguish the rock forms as we pass, but you can feel their energy if you submerge yourself in the stillness. 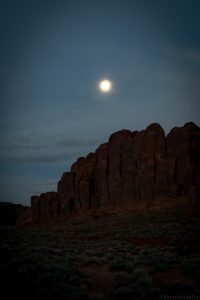 The Mittens, considered to be the hands of a deity among the Navajo, offer their blessing and perhaps protection as we pass and are absorbed by the night. The Navajo consider this valley sacred. In the wee hours before sunrise, it is easy to see why. The rock, the wind and the sky speak in a language lost to the modern world. But words are not needed. It is a magical and primal language, that connects on an entirely different level. It is not long before we are off piste. This is four wheel drive country. The road roughens and the dark is unrelenting. 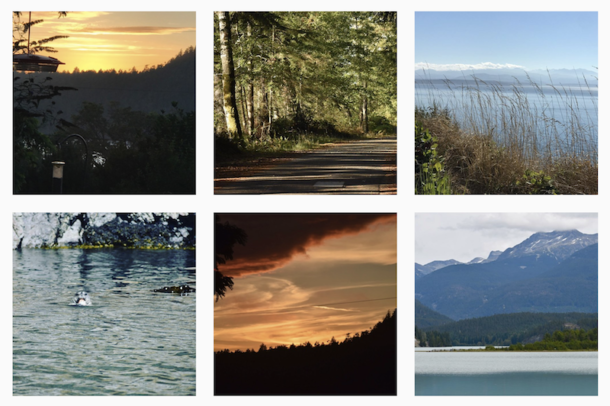 We bounce along rugged paths, climb rocks and splash through puddles. It is easy to become disoriented. The tires sink into the mud pools and water splashes against the door. The engine engages and with the skill of my Navajo driver, we pull forward. He takes off at a brisk pace, sure of himself even in the dark. I pick up my camera gear and follow him into the desert. I have a flashlight but it would seem crass to access it. 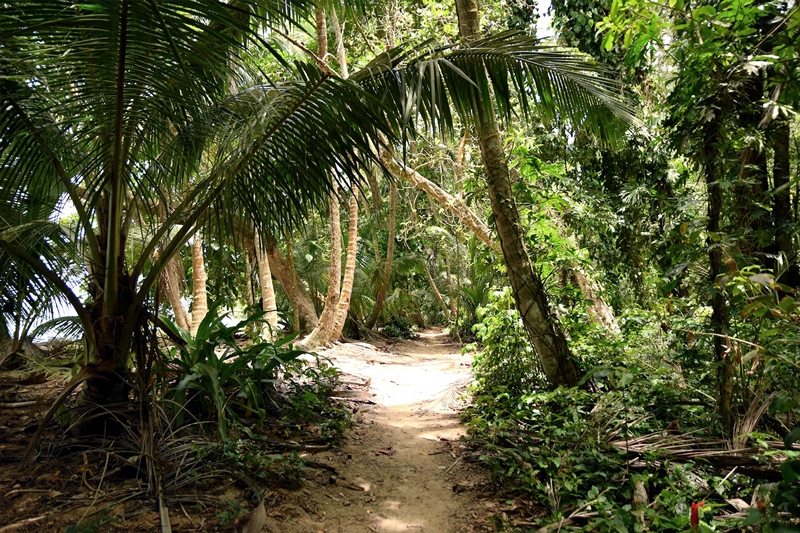 Besides, I struggle to keep up with the firm stride of my guide, as he heads off into the sand. I realize that the moon is peaking from behind the clouds and the orange sand is reflecting just enough light to see. I hope I don’t encounter anything I don’t want to encounter on the desert floor. 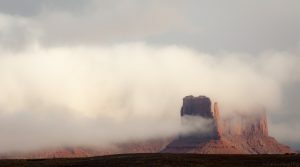 The moon breaks through the cloud cover, shedding just enough light to follow my Navajo Guide into the desert. The sun appears on her own time and the valley comes to light. First slowly, then all at once, But on this morning, there is sun, clouds and mist, all simultaneously, scattered across the land. 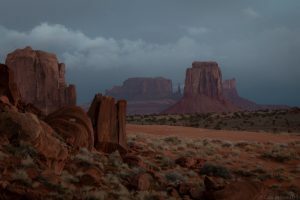 The sun illuminates purple clouds at dawn, in the Navajo desert surrounding Monument Valley. And then the sun rises. In the light the valley loses none of its magic, but I feel I have lost that voice of eternity that perhaps speaks only in the dark. Another day dawns, this one partly shrouded in cloud and mist. The desert is an amazing vivid orange from the gradual erosion of the sandstone monuments. Dark skies to the west. 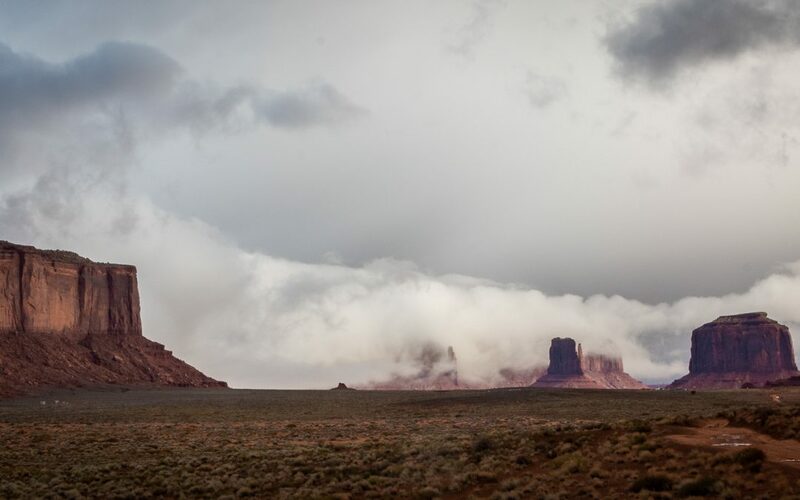 Mystical clouds in Monument Valley. 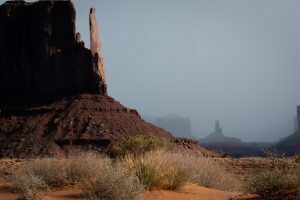 Limited visibility meant veiled peeks and peaks at Monument Valley. Indians have said this is a sacred valley. And before them the Anasazi found a home here as well. Remnants of that civilization are scattered through the desert if you know where to look. Knowing where to look will also bring you to the Ear of the Desert. Something about this massive formation makes one stop and, well, listen. Does she listen to the wind? 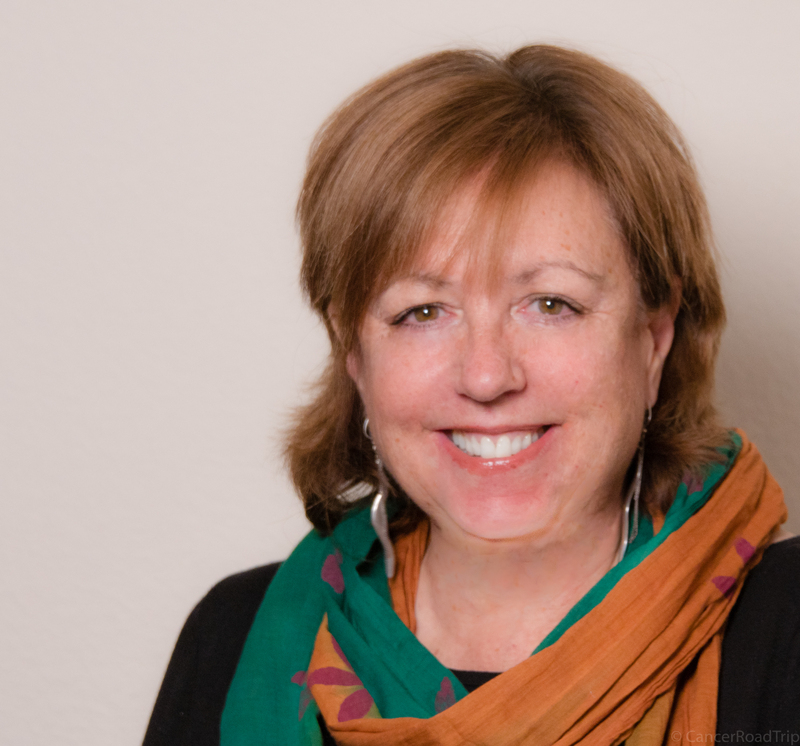 To the wild horses that still roam the land? The air that pours through her portal, what does it whisper? And to whom does she share her secrets? Like many of the lesser known, but most interesting parts of the Valley, the Ear of the Desert is outside the 17 mile circle and not accessible without a Navajo Guide. 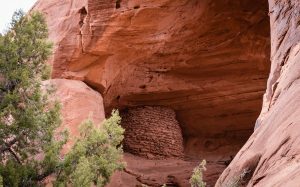 With a guide, there are Anasazi ruins to visit and vistas that will take your breath away. In this giant playground where the wind chases the sand, and the sand carves the delicate curves into the rock, carvings both intricate and crude grace the land. The desert sand is intensely orange. The soft sandstone formations deposit their soil at their base, and the wind whips it into a rippling expanse. It’s a land of wonder and awe. I have a history with Monument Valley. It goes back twenty years or so. It was a stop that was partly by chance and it was by chance that I found the perfect old turquoise bracelet that I’d been seeking but had, so far, remained elusive. An old Indian woman had approached me with half a dozen stunning stone bracelets. Most were sized for a man. Even so I seriously considered them. The workmanship and stones were things you do not find in a tourist shop. They were old and worn. There were stories that went with each one. 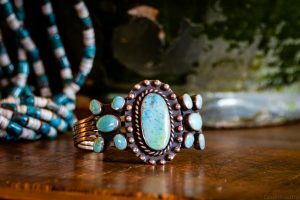 I still recall a deep green turquoise bracelet with a richness of color that took my breath away. But I ended up settling on just one, one perfect one, just for me. That trip, some decades past, presented a different valley. There were no amenities and the road was just a dust track. Wild horses ranged freely through the land. There was little traffic. It was a more wild and mystical place. The rock formations have remained the same, but now Monument Valley is a well run business. 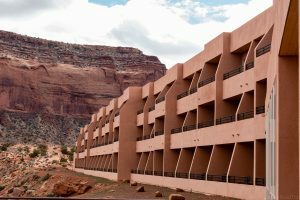 The relatively new Navajo run hotel, The View, provides on site lodging. Today’s experience, along the 17 mile drive offers a view of the valley, but seems to lack the deep soul of a more primitive time. The tourists, he explains, line up bumper to bumper in the summer and drive the loop. But they miss the Valley. You have to go into the land to see it. 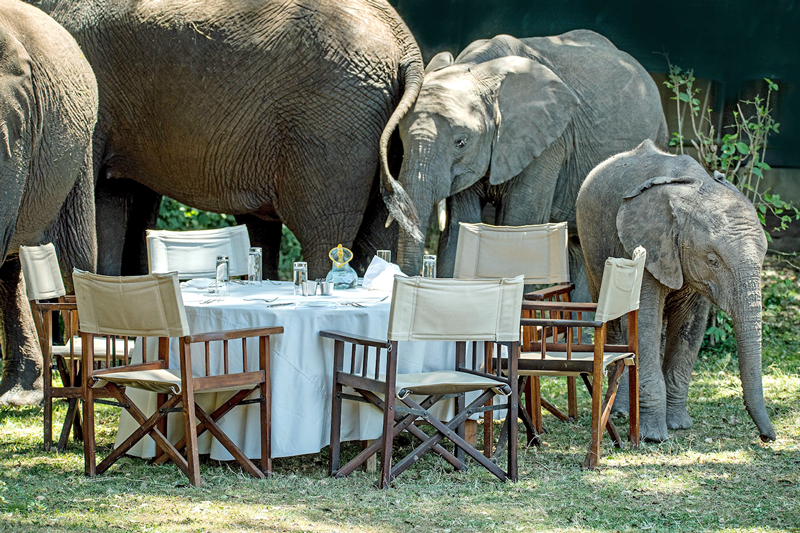 I ask him about the names of the rock formations, particularly Elephant Rock. 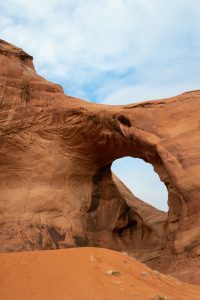 Where would the ancient Navajo’s have seen an elephant, I wondered. Most of the formations were named by Goulding, he replied. 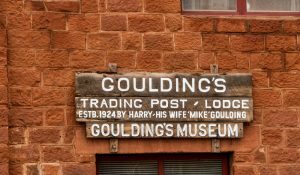 And Goulding is an integral part of the valley’s history. Monument Valley has always been considered a sacred place by the Navajo. Given its remote location, it escaped the Spanish invasion in the 17-18th centuries that disrupted Indian culture in other southwest locales. 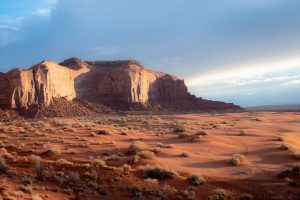 It is also not a national park, but a Navajo run land. 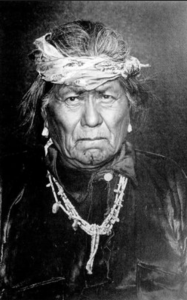 While the Navajo in the area escaped Spanish occupation, the Americans would follow. In 1862 the federal government sought to relocate the valley’s inhabitants. Col. Kit Carson was tasked with rounding up the Indians and relocating them to a reservation in Bosque Redondo, NM. They fled and in 1868 the government relented, and the land eventually was returned to the Navajo. But it was Hollywood that put Monument Valley on the map. Almost against its own will. Harry Goulding, a Colorado trader and sheep herder, bought 650 acres at Big Rock Door Mesa (Tsay Kissi Mesa) ini 1923 where he and his wife “Mike” would establish Gouldings. Over time the trading post grew and a two story sandstone house was built. 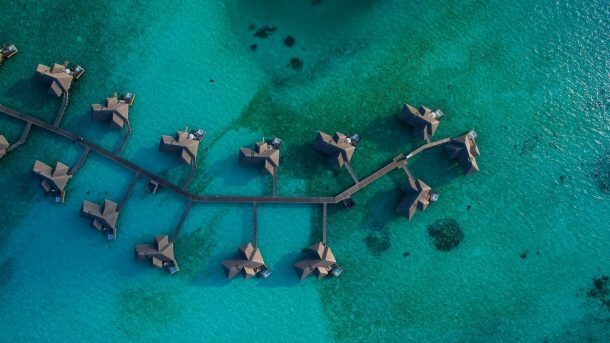 Cabins would be added to accommodate the growth in traffic. With the Depression in the 1930’s, the area was hard hit. Harry Goulding had heard that Hollywood was scouting for southwestern locations. So with his last $60, he headed for Hollywood. Where he was largely ignored. But perseverance (and perhaps a bit of desperation?) paid off and Harry left with a $5,000 deposit from John Ford. The first film by John Ford, Stagecoast, put both Monument Valley and a new actor, John Wayne, on the proverbial map. All thanks to Harry Goulding. Hosteen Tso Holiday, rumored to be the most powerful medicine man in Monument Valley. The film industry provided employment for many in the valley and beyond. Among those hired by Ford was Hosteen Tso Holiday, a locally famous medicine man who was tasked by Ford with providing snow in October. And lo and behold, snow appeared, just as directed. Since that film many more have followed and Goulding’s became something of an institution. In time, the original sandstone building became a museum, which is well worth a visit. There is a fascinating and charming room called The Movie Room which features all sorts of film memorabilia relating to productions from the site. You can visit John Wayne’s cabin and stay for lunch at the Lodge. Goulding’s isn’t fancy, but it’s an integral part of the history of the Hollywood cowboy genre and the history of Monument Valley. Cowboys and Indians naturally come to mind, as they should. 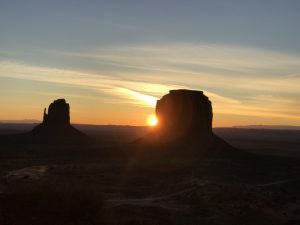 Stagecoach (1939), My Darling Clementine (1946), She Wore A Yellow Ribbon (1949), The Searchers (1956), and How The West Was Won (1962) are all classics filmed in Monument Valley. But the site has been used in a wide variety of other films including Easy Rider (1968), 2001 A Space Odyssey (1968), The Eiger Sanction (1975), National Lampoon’s Vacation (1983), Back To The Future Part III (1990), Forrest Gump (1994), and The Lone Ranger (2013). 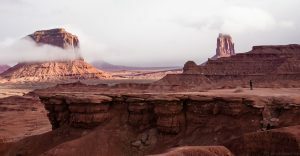 The person in the image provides a sense of scale of John Ford Point in Monument Valley. The western genre which launched Monument Valley into Hollywood fame actually encompasses literature as well. The Last of the Mohicans by James Fenimore Cooper; Mark Twain’s classic Roughing It; and Zane Grey’s novels all inspired the evolution of the film industry in the valley. Trivia question: What was the first film filmed in the valley? Answer: The Vanishing American (1925). Tuck that one away for a fun fact! Flying into Las Vegas, NV and driving is probably the easiest way to visit. But I chose to drive. 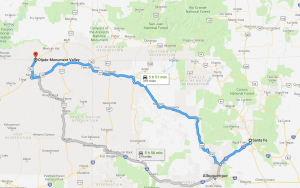 The drive from Santa Fe to Monument Valley is about 5 and a half hours, give or take. And in this part of the country, March is not quite winter, not quite spring. From Santa Fe, I headed south to NM 550, then north. The drive up 550 through Cuba is rimmed with stunning red rock. The road cuts through Cuba, a small town. I suspect that Cuba, like many small towns along the “major” New Mexican travel routes, makes a substantial part of its living off of speeding tickets. Slow down as you go through these towns. I learned this lesson en route to Madrid. But today’s route is north. 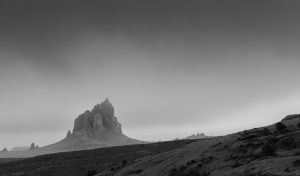 Rain was forecast but when I hit Shiprock, it didn’t rain, it poured. Sheets of hailstones descended in curtains. You could see the frozen squall approach and dump it’s iced balls all over the road. Then a respite. Then another squall. The road was rough, made slick by the weather. Lightning, hail and rain poured over the land, sometimes all three simultaneously. I felt almost battered, by the wind, the ice and the rough pavement. I stopped twice to be sure I didn’t have a flat tire. But by the time I got to Shiprock, the worst was behind me. Past Shiprock, there are two approaches to Monument Valley, either through Kayenta or Bluff. Bluff is the slightly longer route. Take it. 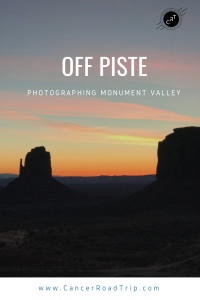 Because you’ll cross the San Juan river, travel through Mexican Hat, and see some spectacular western scenery as you approach Monument Valley from the east. I actually took both roads, coming in through Kayenta and back through Bluff. Bluff is the more scenic of the two routes, and offers access deeper into Utah and the spectacular vistas in that area. If you want to stay near the valley there are two choices: Gouldings and The View. The View is a relatively recent, and pricier addition, located at the entrance to the park. 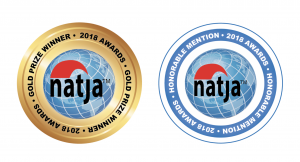 It’s Navajo run (and dry–no alcohol on the premises, and Goulding’s to the north is in Utah. If you crave a beer after a hot day in the valley, it’s strictly BYO). Built in 2008, The View offers free standing cabins and premium and Starview rooms in the main building.The Starview are located on the third (top) floor and offer more of a sky view. The morning view of Monument Valley from my room at The View. Like many places these days, Monument Valley offers a well traveled tourist experience. 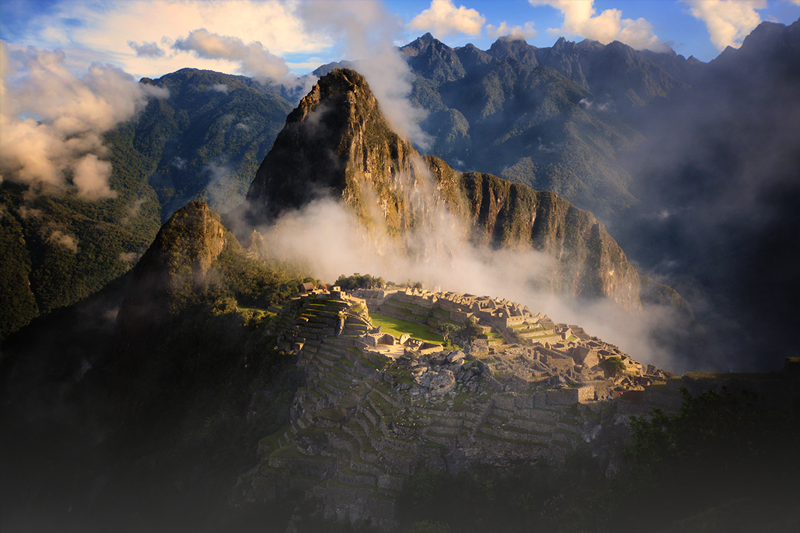 But that is such a limited dimension to this sacred valley. If you go, consider one of the Navajo Guide services to take you beyond the 17 mile loop. 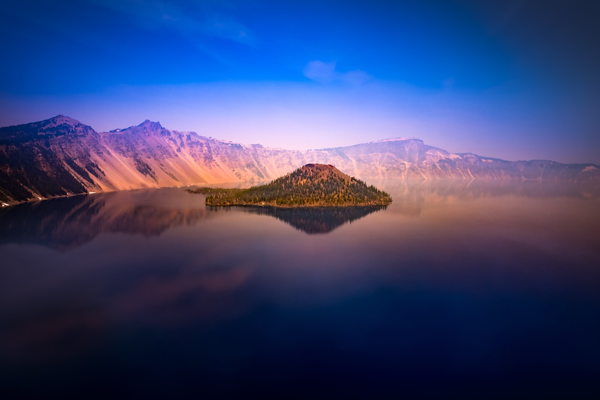 Phillips Photography offers customizable photo tours that combine scenery and history in this magical land.